In my book-shelf, there is a collection of the Bengali works - in prose and verse - by Rabindranath Thakur, complete in seventeen volumes, brought out on the 125th anniversary of the author’s birth. Popular as Robi Thakur, he lived during the last thirty-nine years of the 19th century and the first forty-one years of the 20th. 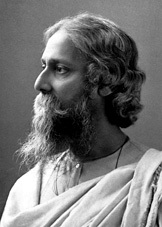 At the age of fifty, Thakur is said to have translated a selection of his poems into English and published them under the signature of Rabindranath Tagore but, in spite of receiving a coveted award like the Nobel Prize in 1913, he was more of a traitor than a translator of his own poetry : quite indifferent to the aesthetic specificity of his prosody intimately married to the semantic excellence of the compositions, he wanted to avoid hurting the puritan English-reading public with the initial ornamented presentation of his poems. Fortunately the number of his works thus “translated” represents rather a small portion of his total publications in Bengali. Encouraged by the audacity of earnest translators who, down the decades, have successfully tried their art and science in bringing out Thakur’s original Bengali writings – often approved by the author - in other languages of India and of the world, since long I had been planning to test my merits in this craft. Author of an anthology of Bengali poetry in my French translation (in addition to some other similar exploits), I have also tried my hand in translating mostly French authors – René Char, Albert Camus, St-John Perse – into Bengali. The chronological order of the poems helps the reader to appraise the blossoming of the poetic genius of Thakur. During his stay on the houseboat at Shilaidah in the 1890s, in close contact with the rural life of the subjects of his family estate, Thakur was in a mood to produce an interesting crop of short stories, along with the narrative groups of poems included in Katha ("Tales") and Kahini ("Legends") : though most of them are well known to the Bengali readers, I have not selected them for the time being. Thakur did not name some of his short pieces such as in Kanika (“Morsels”), even though each of them be a complete poem; I have taken the liberty of naming them. For obvious reasons, I have sacrificed the rhymes of the Bengali origin. The heart has woken up. I can restrain no more. The exit of their prison. They seek to climb up to the sky. If I find a place inside a living heart. By composing a song with human joy and sorrow. For you to pluck at dawn and at dusk. Throw them away once the flowers will have faded. Illuminates the mortal home of man. Wearied in the evening it sets thereon. On the sacred twin peaks immaculate. They keep on sprinkling the lips of the universe. With the nectar-fountain of eternal love. They are vast solace for the helpless world. Motherland of men who are children of God. Shed your garments, drop the veil. Attire of a heaven-lass dressed in light. A feast of life and youth and grace. Come and stand alone in the wonder, this world. Let permeate your limbs with zephyr’s caress. Like naked Nature spangled with stars. With bended head ashamed of the body’s bloom. Each limb craves for every limb. Union of spirit looks for union of bodies. Longs to faint into your body. Lips want to die inside your lips. To contemplate you with every limb. Eternally I keep on weeping on its bank. I shall plunge into the mystery of body. Will get absorbed in each of your limbs. Memories of hundreds of life, it seems. Like songs of springtime life after life. A host of moonbeams of a new sky. Have assumed that honeyed body this day. Life appears to melt into an elsewhere. The evening twilight is bound by a spell. On the canvas the evening star has not set. She sleeps resting her head on an arm. In the midst of a permanent vigil on earth ? And has poured them for ever inside her ears. Keeps on gushing in silent songs. She will cover her breast with her robe. Union resembling a hungry death. Strip me of modesty, of raiment, of screen. Bereave my eyes of sleep, of dream of sleeping. My life and my death, for an eternity. Let you and me become beauty infinite. Where lies this union without You ? Before it falls even out of its joy. Becomes a jasmine by the side of a forest. Infinity manifests at the heart of the moment. That I carry within myself. In the midst of it rejoices the moonbeam of joy. I kept watch on you with my legion of constellations. Dawn came, my term was over. The nocturnal intimacy was rent by light. Merely a vigilant gaze, mere dialogue from mind to mind. Fell from mine eyes to yours. I disappeared. Turning more beautiful your beauty in bloom. 3.Composed on board the Tames (25 October, 1890) on his return trip from Europe, while crossing the Red Sea ; Tagore recognises that originally the poem had been written in English by his friend Lokendranath Palit. Only retaining modesty for myself. Carefully I keep myself covert. And it drives me sick with shame. Before I get suddenly aware. To forget myself for a while. Under their veil of grace. I can recall nothing more. Capable of hiding it imperfectly. Slightly turning my face away ? I am not toying with you. Tenderly gazing at my face. A fair of vernal flowers. That the string would sever. Before the music was over. The full moon night would be fuller. 4.East, West, North, South, their intersections, the Zenith and the Nadir. Therein entered a poor man weary and naked. The beggar assumed the Divine’s form. The God said : “You have turned me out. My valet did not turn up in the morning. The imbecile was absent last night. Nor how to prepare my breakfast! I wait for my turn to censure him. And stands with folded hands. To attend his lonely chore. The heartbeats of this endless universe. The noon of April keeps on lingering. The earth is thirsty by the scorching day. My curiosity cropped up by that affectionate voice. Half opened the door to peep outside. Was waiting on the riverside with tender eyes. My amusement was moist with serenity. Acquire the knowledge whether the creation is real or an illusion. I contemplate the creation in broad daylight. Sculptors go on immortalizing your image. He has rarefied you by concealing. By half you are human, and imagination by half. 5. Manasi, ”She who is born out of Manas” : in Indian Philosophy, Manas is the 6th Sense which precedes and guides the five others. Saluting as brothers the moon, the sun and the stars. It sighs while contemplating the Void. Clings it to the earth as its kith and kin. It can soar at will to its luminous sphere. The sun is not its relative, the earth is its all in all. Both disputing to determine who was the stronger. That you cannot sting as hard as I do. The bee remained speechless with tearful eyes. You lag behind in poison, but you are victorious in honey. The axe proposed : I beg of you, O Sal (8) ! I have no handle, spare me a branch. The poor Sal lost its notion of beginning and end. 8. Shorea robusta Gaetern, tall and robust trees : the leaves are used for packing eatables. If you call me brother, I shall throttle you. The kerosene calls out : Welcome, big brother ! What can I offer you in return ? I possess nothing ! You grant me the pleasure of making you a gift. Dr. Prithwindra Mukherjee (b. Calcutta, 1936) is a poet, historian, musicologist, translator (Bengali↔ French↔ English), author of more than 50 books, 12 LPs/CDs, 2 Documentary films. He has done more than 100 hours of features broadcast on Radio-France. Awarded a French Government Scholarship (1966-1970) and Fulbright Scholarship (1981), Prithwindra has also served as Research Fellow, Centre National de la Recherche Scientifique, Paris (1981-2003); Lecturer : University Paris III-INALCO and University of Paris-XII (1974-1981); Chevalier in the Order of Arts & Letters (2009). Bengali readers remember him for his translations of Albert Camus, St-John Perse, René Char. Prithwindra also writes in French. His French poetry has been translated into about a dozen languages.